I was browsing the t-shirts on Threadless the other day because I am one of the judges for the amazing Threadcakes competition. They have some fantastic designs out there, and while I’ve seen some foodie ones, I haven’t noticed too many coffee-inspired creations. I did a little searching and found out that there are a few out there! 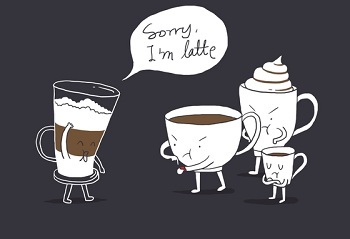 This Coffee That’s Always Late shirt got a laugh from me. I just thought the design of some of your favorite coffee-shop drinks was very cute – and I liked how the artist tried to capture the makeup of a latte (espresso, milk and foam), too. I also liked the art of the Veni Vidi Venti tee, which shows exactly what is under that coffee sleeve. Definitely a fun shirt, and I have a feeling that this is one you’ll get some comments on when you’re in line waiting for your drink next time. The Drink Mee tee is self-explanatory. And I think that we’ve all felt this way at least a few times. Of course, a tee might not be enough to get you started in the morning, but it just might help you get to the coffee shop with a little more style!